A clean home is something that we all want. It is just more comfortable being inside of a home that is fully cleaned. One of the biggest issues with a clean home is the carpet. It is amazing how much dirty carpets can do to the appearance of your home, making it essential to ensure that the floors are always free of dirt and debris. Of course in order to keep the floors clean it is essential that the best vacuum cleaner be inside of your cleaning room. With hundreds of cleaners out there making the right choice can seem like a major headache; until now, that is. After reviewing dozens of vacuums on the market, the Hoover SteamVac Carpet Cleaner with clean surge has deemed itself to be on the top of the list. It is a cleaner that proves itself in more ways than one while winning the hearts of so many. Most cleaners make claims of cleaning the floors in your home, yet do nothing more than move dirt and debris from one spot to the next. Not the Hoover SteamVac Carpet Cleaner. This vacuum works to ensure that your carpets are truly cleaned, with powerful suction that removes all of the dirt from your floors, even the dirt trapped underneath the surface. The vacuum features a powerful 12-amp motor that works to get every single bit of dirt that is trapped in your floors. No more will you clean only to discover that you’ve done nothing more than move dirt around. There are also five spinning brushed on this machine, making it easy to clean carpets, bare floors, upholstery and so much more. Think of it as an all-in-one machine that takes care of all of your needs! When you’ve cleaned your carpets with this vacuum you will instantly feel clean. A refreshing smell is most delightful, and one look at your carpet will ease your mind knowing that your carpets have received the deep-down cleaning that you are after. The cleaner dries fast so there is no waiting hours to walk on your carpets again. A built-in heated drying mechanism ensures that your floors are clean and dry within a short period of time. Who could ask for more? Many of the carpet cleaners on the market today require that you be gone or off the floors for hours, but not the Hoover. Clean and in no time your floors are dry, clean and ready for you to live your life. Are there grimy spots in your carpet? 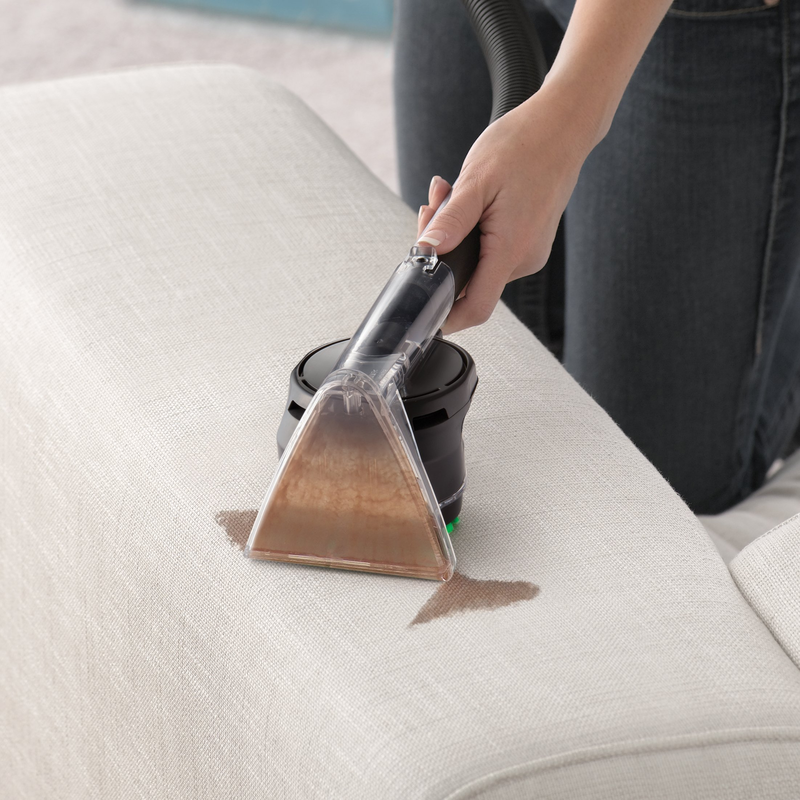 The Hoover SteamVac comes equipped with Clean Surge. Simply press the button and you’ll get an extra burst of cleaning power to take care of these extra-dirty messes inside of your home. You can clean your carpets with the Hoover SteamVac carpet cleaner, but that’s not all. This multi-purpose cleaner works great on upholstery as well. No more buying separate devices to clean your home as this vacuum works wonders on so many other areas of the home as well. There are two separate canisters on the SteamVac. One lifts away the dirt while the other provides clean water for you to take care of the entire home. No more will you mix dirty water and clean water when you have the Hoover SteamVac! How Much Does The Hoover SteamVac Cost? Purchasing the Hoover SteamVac will certainly cost less than what you would be willing to pay for such a powerful machine. Amazon always has the best prices for the Hoover cleaner, and you’ll never pay more than $175 when you make your purchase here. In fact, Amazon offers a much lower price as well as free shipping and other special offers that you are sure to enjoy. A one-year warranty is included with the vacuum cleaner at no additional charge. If the machine fails to provide you with the carpet cleaning power that you want, return it and you’ll get a replacement machine or a refund. When a company can guarantee their product you can feel confident in making your purchase! Weighing in at 20 pounds, the Hoover SteamVac Carpet Cleaner offers a lightweight solution to heavy, bulky cleaners. At this weight anyone can easily move the cleaner from area to area with ease and without breaking their back. Even if you have an upstairs and a downstairs you can move this machine with ease. And, since the machine can help you clean upholstery and other items, it is a vacuum that offers all of your money’s worth and then some. If you are tired of wasting money on machines that fail to provide all they promise it is time to make the change and spend your money on a cleaner that is worth your money and so much more. The Hoover SteamVac could easily sell for more and consumers would still love it. Where Can I Find More Reviews Of The Hoover SteamVac Carpet Cleaner With Clean Surge? Reviews help buyers make their purchase with confidence. If you are interested in learning more of what users have to say about the Hoover SteamVac carpet cleaner, click here and you’ll be taken directly to Amazon to read reviews. There are hundreds of different reviews available here, helping you learn every single detail that you need to know concerning this cleaner. Where Can I Buy The Hoover SteamVac Carpet Cleaner With Clean Surge? If you are looking to obtain the Hoover SteamVac Carpet Cleaner with Power Surge at the best price, go to Amazon to make your purchase. Of the many available places to purchase the vacuum cleaner, Amazon always has the lowest prices on the vacuum cleaner, as well as free shipping and many other attractive offers.